The Royal Regiment of Canadian Artillery – also referred to as “The Royal Regiment”, “the Regiment” or “the RCA” – comprises the Regular and Reserve units of the artillery branch of the Canadian Armed Forces. It is a potent and vital force multiplier within the spectrum of the Canadian Army’s combat capabilities and has a long and illustrious record of contribution to the success of our Nation’s military endeavours from colonial times to the present – a contribution founded on our ethos of “On Time and On Target”. At the head of the Regiment are the Sovereign – our Captain-General; the Colonel Commandant; and, the Senior Serving Gunner. Other Senior Regimental Appointments include the Director of Artillery, the Regimental Colonel and the Regimental Sergeant Major RCA. Honorary Colonels and Honorary Lieutenant-Colonels support Reserve Force artillery units and provide a valued link to local communities as do, for all units and the RCA as a whole, “friends of the Regiment”. In keeping with the philosophy, history and customs of the Army’s regimental system, The Royal Regiment is deemed to constitute a family – the Regimental Family. This family is one which embraces the entirety of serving, former and retired Regular and Reserve Force Gunners as well as their own family members, the members of our associations and, friends of the Regiment. In the broadest sense, the Family includes all of those who wear or have worn our cap badge, plus the many who support us. The Regimental Family reflects our Regimental adage: “Once a Gunner Always a Gunner”. This is a belief shared by our Allied Regiment, the Royal Regiment of Artillery and by other Commonwealth Royal Regiments of Artillery. It may also be said, that in view of its roots put down during the early days of European settlement; its intimate involvement with many of the key events of our country’s history; its presence in locales from sea to sea; and, its bilingual character, The Royal Regiment of Canadian Artillery is very much a national institution. 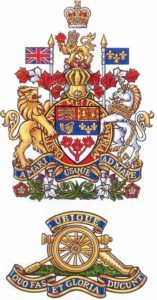 The purpose of this website is to serve as a library of information of enduring value concerning The Royal Regiment of Canadian Artillery. It is not meant to be a source of current news. Such information can be found on the Regimental and RCAA Facebook pages and in the Canadian Gunner Newsletter. Members of the Royal Canadian Artillery Association can log-in on this website to gain access to further information concerning the governance and management of the non-public affairs of the Regiment. Finally, this site offers an convenient way of donating to the RCA Regimental Fund, the RCA Heritage Fund and to the Royal Canadian Artillery Association.